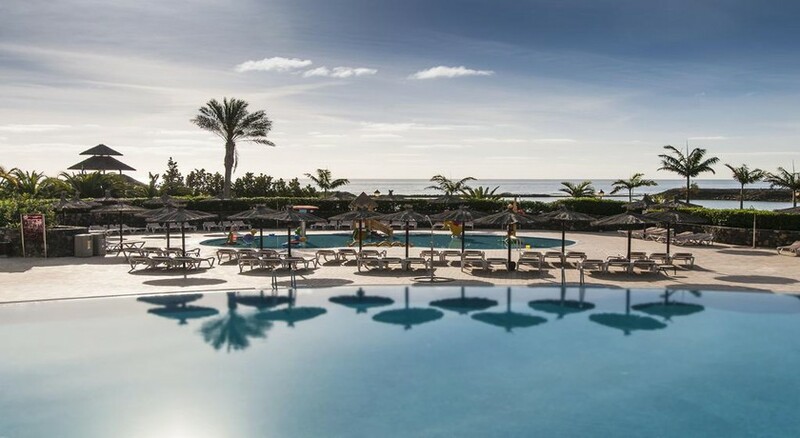 The Sheraton Fuerteventura Beach Golf & Spa Resort enjoys a fabulous location, making it convenient for beach lovers, city lovers and shoppers alike. There are many beaches, historical attractions, museums and a water sports centre close to the resort including the Salt Museum (3km), Oasis park (46.7km) and Jandia Beach (63km). The Fuerteventura Airport is only 8.6km from the resort, making it convenient for the guests to board their flights on time. Comfortable, massive, beautiful and relaxing are some of the words that describe the rooms in Sheraton Fuerteventura Beach Golf & Spa Resort. 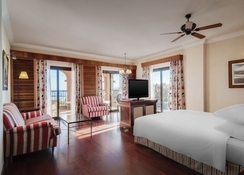 Most rooms come with a pool view and ocean view making your stay even more memorable. 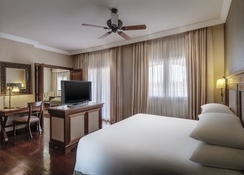 The hotel offers guestrooms in the following categories: Deluxe Room, Premium Room, Family Premium Room, Junior Suite with Garden Views, Junior Suite with Sea Views, Executive Suite, Duplex Suite and Presidential Suite. All the 266 rooms and suites are well-equipped with a hairdryer, Jacuzzi, separate bathtub and shower, rollaway beds, Sheraton signature sleep experience, cribs (upon request), 24-hour room service, refrigerator, tea and coffee maker, flat screen TV with cable channels, Sheraton dog bed available, Wi-Fi (0-5 Euro per day). Free Wi-Fi is available to all the guests who book online. 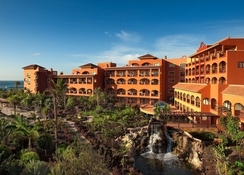 There are six dining and drinking options in the hotel satisfying different appetites of all the guests. The Someplace Else Bar offers wide-ranging beers and other drinks to choose from in a lively and casual environment. Hit the El Faro Restaurant for Mediterranean delicacies blended with local and international dishes. Whenever you take a break from swimming, you can take advantage of the pool bar that serves refreshing drinks and snacks. If you are fond of culinary delights from Chinese, Malaysian, Japanese, Thai, Singaporean cuisines then the Wok-N-Zen Asian Fusion Restaurant is the right place to be. Savour sandwich, potatoes and salad, while enjoying the spectacular view of the ocean and the beach at the La Isla Beach (offsite). Get yourself immersed in the finest Mediterranean cuisine and at the same time admire stunning views at the La Veranda Restaurant. You can overlook the garden from the terrace of Los Arcos Buffet, while enjoying Mediterranean delicacies and finest wines. Sup your favourite cocktail or afternoon coffee, while enjoying marvellous views of the sea at the Piano Lobby Bar. The kids too can enjoy wide-ranging delicacies with an all-inclusive SPG Kid’s pass. 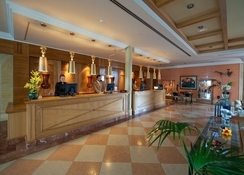 The hotel has abundant sports, entertainment and leisure facilities to keep the guests engaged. Some of the facilities in the hotel include beach access, outdoor Jacuzzi, outdoor and indoor heated pools, outdoor children’s pool, steam bath, sauna, tennis court, Sheraton fitness, Hesperides Thalasso Spa, billiards and much more. Kids too can have a lot of fun in the Yambaland Kids Club under the supervision of the resorts staff members. Loved every minute..from booking in with an ice cold welcome drink to easy stress free pick up. Room was amazing. Two balconies. Clean and spacious. Lots of little goodies to add to a perfect holiday. Hotel stunning grounds. Breakfast excellent . Kelloggs cereal not cheap imitation. Have to be fussy not to eat here. Excellent location. Beach was beautiful although the water was freezing 😁. We will definitely be back. First time in Fueterventura and very impressed. Wind was very cooling . Lots of free sunbeds and pool was warm . In need of refurbishment but overall ambiance of hotel is fantastic.